The Florida Leadership Academy was formed in August 2004 with an intimate group of 30 students. The goal of the program was to provide the top sophomores of the college with professional development opportunities. Since, the program has grown to 100 students each year. 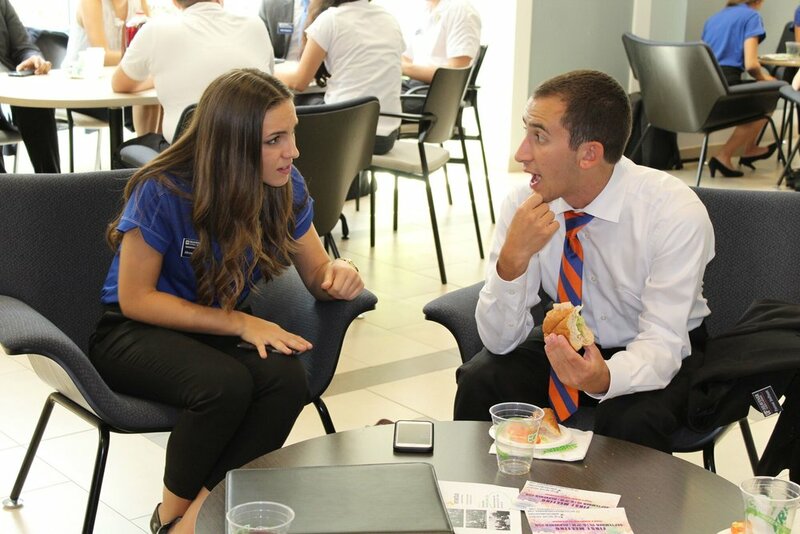 The program only accepts students who have demonstrated academic excellence and leadership initiative in high school and their first semester at the University of Florida. As a part of the program, students are required to attend weekly Friday speaker sessions, complete a community service project, and interact within their mentor groups. FLA meets ten Fridays in each semester; only one absence is allowed in the program per semester. During these two hour sessions, students hear notable speakers from the corporate, governmental, and nonprofit sectors to learn about careers and professional development opportunities within these fields. In addition, students are broken up into small groups where they are assigned a mentor from the previous year’s graduating class. These small groups allow FLA students to develop a peer network within the program and build teamwork skills. The sessions are concluded with a networking luncheon for more casual and personal conversations. To get a sense of the activities completed during our sessions, please check out our Calendar page to learn who will be speaking this semester. This principle focuses on the process of acquiring knowledge and transferable skills through a holistic understanding of the past and current workplace. As a group, we try to analyze the behavior of leaders within their organization and tie it to future success. Awareness, development, and use of career-related skills is key to successfully mastering this principle of the program. The Florida Leadership Academy selects qualified speakers that will inform students and help to develop career-related skills. In the business environment, students will be exposed to a number of situations that will test their judgment. Stories, such as Enron and WorldCom, are key examples of business leaders that demonstrated poor ethical standards. The development of core values help the student to deduce a standard code of ethics. Thus, our goal is to empower students to create high ethical standards for themselves and their peers. Through a business ethics simulation and discussion, students will feel empowered to become positive role models through transparency and authenticity. Personal and professional growth are fundamental to the Florida Leadership Academy. It is important for students to develop their critical thinking, communication, and problem solving skills in order to enhance their effectiveness in every segment of their life. Through the mentor groups, our goal is to ensure every member of the program reflects on their career goals and develops a network of high-achieving students for the future. The Civic Engagement pillar provides a unique way for FLA members to explore their individual passions, while also making a positive impact on surrounding communities. Movements created by engaged students can lead to transformative change by building the foundation for corporate social responsibility. As global corporations evolve, corporate social responsibility and dedication to service is becoming just as important as the bottom line. Through our legacy project with GRACE marketplace, semesterly Servant Leader Projects, and community service socials, members have the chance to build a foundation of corporate social responsibility while making an impact on the local Gainesville community.